Given the significance of the subject and the urgency which it entailed – it was an event that had to happen! Netizens for Democracy held a day long conclave on ‘Social Media as a Tool’, of Indian netizens who believe in the power of social media and want to use it to bring about sustainable and positive social change. It was held on January 19, 2019 at Fr Agnel’s Campus in Bandra, Mumbai. The conclave brought together some of the most well-known names of the country -- all concerned about what is happening in the India today and the need to do something immediately and collectively. It was certainly a heady mix of youth leaders, journalists, activists and celebrities. They deliberated on how to spot and stop fake news, deal effectively with trolls and check the spread of hate and vitriol on social media. It was a quest for solutions that help us essentially hold our own while preserving the dignity of the platform and our own sanity, in India at this crucial socio-political juncture. Most importantly, the conclave was a quest for ways and means to empower people from some of the most vulnerable sections of society, in order to strengthen our democracy. Social media all over the world, and particularly in India, is today recognized as a valuable tool for giving voice to entrenched interests, especially when marginalized sections excluded from access to the mainstream media in general, have creatively used this space for expression on issues fast recognized as the ‘deep dark underbellies’ of our society. The conclave emphasized the belief that social media can be a powerful tool in the hands of good and socially conscious citizens who can use it to create awareness, provide encouragement and bring renewed vigour to the culture of dialogue and discussion in our vibrant democracy. Every session of the conclave was invigorating and provided much food for thought and concerted action. The honours of the inaugural session was done by Prashant Bhushan, Justice Abhay Thipsay and Sambhaji Bhagat. Sambhaji also regaled the audience with a stirring Lokshahir performance, in his own unique style. 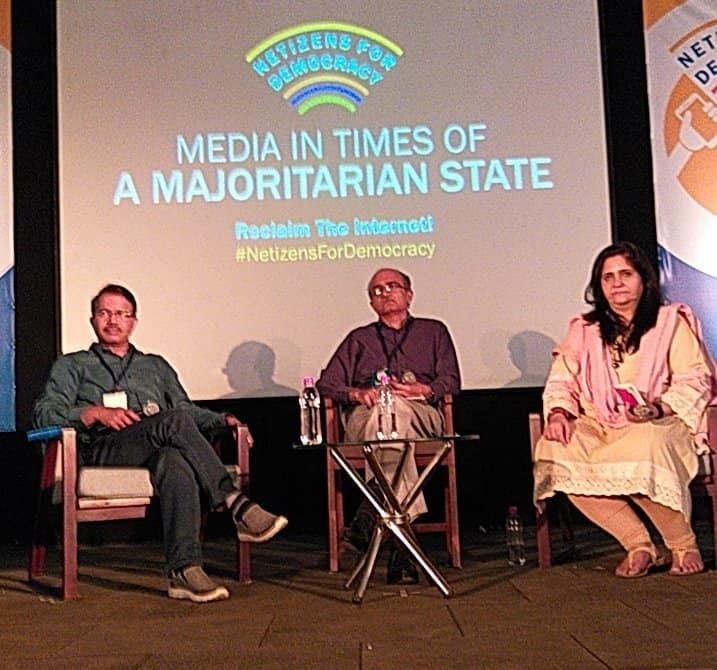 'Media in Times of a Majoritarian State' was anchored by Teesta Setalvad with powerful insights from Prashant Bhushan and Dilip Mandal. This was followed with another ground reality dialogue on 'Combating Hate' between Ruben Mascarenhas and Rachna Awatramani. Subalterns had their say in the session on 'Shining the Light on Subaltern Voices'; Arfa Khanum, Divya Kandukuri and Abhay Xaxa left no stone unturned to highlight the plight of the minorities, Dalits and Adivasis in the country today. Durgesh Pathak in 'Crafting a Connect: Online Support and Grassroots Change', emphasized the need for change at the grassroots. Akash Banerjee provided a greater awareness to the reality that is taking place on the net today. Shashi Tharoor minced no words when he said that “trolling is an organized technique of the ruling party”. 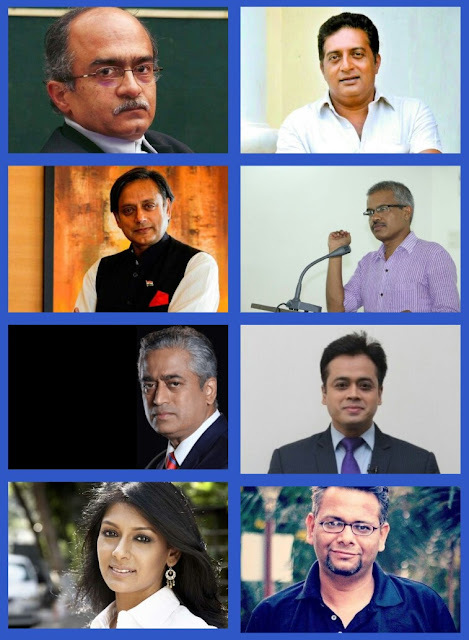 Later, Abhisar Sharma, Umar Khalid, Gurmehar Kaur, Sanjukta Basu and Preeti Sharma Menon elaborated with their personal experiences of how censorship and trolls was the bane of the country today. It was certainly "the March that touched a hundred million hearts" when CPI(M) leader Ashok Dhawale and seven-time MLA JP Gavit of the CPI(M) from Surgana and Kalwan, Maharashtra, spoke about the 30,000-strong historic Kisan March and how the netizens of Maharashtra had so effectively contributed to it. Nandita Das was candid when she shared on the topic, 'My Journey with Social Media – A Hesitant Relationship'. Jency Jacob, Kishore Mandhyan and Pankaj Jain gave the audience numerous instances of the ‘Spread of Hate and Fake News on Social Media’ – particularly by the ruling dispensation. Rajdeep Sardesai, was at his eloquent best when he spoke on ‘Hate, Hype and Dialogue’; he asserted that, ‘citizens need to wake up now and act- before it is too late! The session, 'Organising Social Media Beast for Change', which was moderated by Rajdeep Sardesai, had some eminent panelists like Richa Singh, Dilip Mandal, Jairas Banaji, Jaaved Jaaferi and Harish Iyer. “At Netizens for Democracy we are committed to providing a safe space and discrimination-free experience for everyone, regardless of their religion, ethnicity, caste, economic strength, skin colour, gender, sexual orientation, disability, physical appearance, body size or race. We do not tolerate harassment of participants, speakers or staff in any form. "Harassment includes (but is not limited to) offensive verbal comments, sexual images in public spaces, deliberate intimidation, stalking, following, harassing photography or recording, sustained disruption of talks or other events, inappropriate physical contact, and unwelcome sexual attention. These policies apply at every space at the venue and to all participants in every role. Participants who violate these rules may be expelled from the venue at the discretion of the organisers. In case you have a grievance, please email us at netizensfordemocracy@gmail.com." The slogan of the conclave was loud and clear: “Reclaim the Internet”. The hashtag #NetizensForDemocracy was trending in the first spot all over India during the conclave. The conclave was jointly organized by Sabrang, All-India Professionals' Congress, Let Mumbai Breathe, QTP and ‘INDASDA Foundation. Thanks to the tremendous efforts put in by Teesta Setalvad, Ruben Mascarenhas, Mathew Anthony and whole group of committed collaborators and volunteers, the run-up to the elections 2019 is definitely going to be a very engaged time in the history of India. All present at the conclave were convinced that change is imminent and that a new chapter of democracy will soon begin for the citizens of our country!